2013-11-15 - Powerships are floating power plants that can sail to locations where there is a temporary need for additional generating capacity. ABB has supplied synchronous generators for powerships that have been deployed to regions experiencing power outages. With their distinctive appearance, powerships operated by Karadeniz Powership Company are a welcome sight in areas where there is an urgent need for extra generating capacity. They are generally deployed to a location for two to five years and typically supply power to a city or industrial facility near to the mooring site. Each powership is equipped with a number of diesel or gas powered gensets. The vessels in the Karadeniz fleet currently have generating capacities ranging from 45 to 250 MW, and the fleet’s total capacity will be over 2500 MW when ships currently under construction become operational. Once its fleet is complete, Karadeniz - which is based in Turkey - plans to operate powerships in the Middle East, North Africa and South Asia, and is also looking into the potential for meeting demand for extra generating capacity in countries like the UK. Gensets for a number of the powerships have been supplied by MAN Diesel & Turbo of Germany and incorporate MAN large-bore diesel engines and ABB generators. The engines either run on HFO (heavy fuel oil) or are dual-fuel designs. Dual-fuel engines use liquid fuel or gas, with gas operation providing extremely low emissions. Some of the ships are also equipped with steam turbines which are powered by steam produced from waste heat. 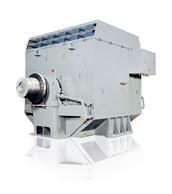 ABB has so far supplied 25 high voltage synchronous generators for the gensets on Karadeniz powerships. The generators are designed for high efficiency, with losses minimized through the effective use of materials, advanced insulation and optimization of key components. “We’ve worked closely with the people at MAN Diesel & Turbo to custom fit the generators for the powership application, which is a combination of stationary and shipboard power plants. The generators are air rather than water cooled. They have to allow a small tolerance for pitch and roll, because wave movements can cause the powership to sway. This makes it important to select the right bearings. The aim is to make sure the generators will have a long and troublefree operating life,” says Tero Ottelin, sales manager for generators, ABB. High availability is vital for power plants, so service may be needed at very short notice if something goes wrong. With local service centers backed by a global organization, ABB’s support network can deliver a full range of services for generating equipment – no matter where it is located. Fast response translates into minimum downtime and maximum power production. The generators supplied for the Karadeniz powerships are brushless, open ventilated units in frame size 1600. They are regular power plant generators that have been custom fitted for shipboard installation. ABB also offers a separate marine generator range, with products specifically designed to meet vessels’ onboard power needs. Generators supplied by ABB are operating on Karadeniz Powerships Fatmagül Sultan (203.1 MW) and Orhan Bey (134.6 MW). Both ships were built in Turkey and are now anchored in Lebanon. Fatmagül Sultan arrived in April 2013 and since then it has been supplying electricity to meet the needs of the capital, Beirut. It was joined by Orhan Bey in September 2013. Under the terms of their present contract, the ships will remain in Lebanon for three years. Karadeniz Powership Fatmagül Sultan has a total generating capacity of 203 MW. Picture: In courtesy of Karadeniz Energy Group. Lebanon has experienced power outages in recent years due to a combination of rapid growth and aging electricity infrastructure. In these types of situations powerships offer a rapid and effective solution to meet the demand for power.